Money-supply growth is an interesting and unusual recession indicator. It’s reliability has been excellent, so long as you provide for its delay; its troughs usually occur about a year ahead of actual recessionary conditions. 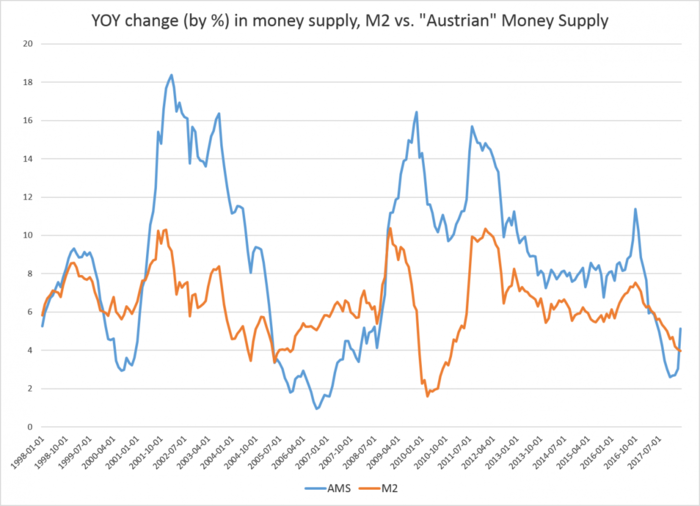 Using the more accurate Austrian money supply metric, which rightly includes Fed deposits, it appears the trough is decidedly in, pointing to a near-term economic contraction. In March, growth in the supply of US dollars increased at the highest rate seen in ten months. This comes after a year-long period of falling growth rates, at the end of which money-supply growth fell to a near-ten-year low of 2.6 percent, year over year. What does the trend in money supply indicate? Historically, a sizable drop in money supply growth rates suggests that a recession is on the horizon — but not on the immediate horizon. 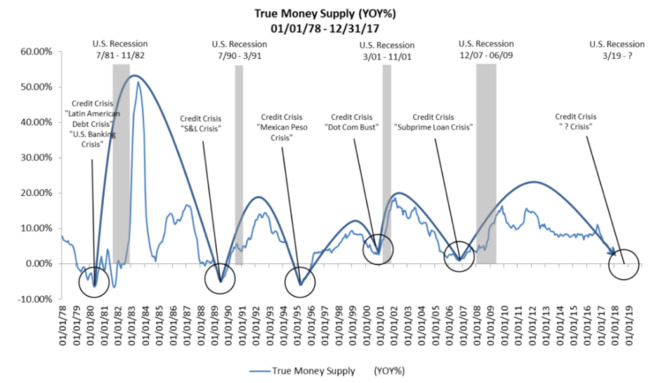 In this graph, provided by RealForecasts.com, we see how dips in the money supply growth rate often precede recessions, but with a lag period of a year or so. In many cases, money supply growth is trending upward again by the time the recession officially begins. Does the recent downturn and subsequent uptick indicate a recession? It’s difficult to say how long the current boom period will last. Some indicators suggest problems. Delinquencies in auto-loan debt continue to trend upward, and growth in commercial loans remains new multi-year lows.